Though people can learn other languages at any time, it’s much more beneficial if started at an early age. But why should children learn a second language? A second language opens up a window to a wealth of opportunity for children in their school years and in the years to follow. How often have you bought your kid that one toy they just had to have only to find that less than a week later it holds absolutely no interest for your child? The toy likely ended up discarded in a pile, taking up space, no longer played with. I know you’ve been there and done that. So this holiday season, why not give your child a gift that last a lifetime? As a Parent, giving your child the opportunity to learn a new language is a present that gives your kid an edge in life, builds valuable skills, and is something that will be with them forever. Starting at young age is important. And Muzzy is the ideal vehicle to send your child down the path of learning a new language. 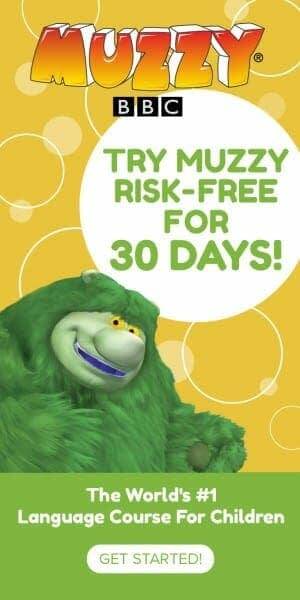 Developed by the BBC, the Muzzy system has introduced millions of children worldwide another language. Muzzy uses animated videos featuring a host of fun characters in order to convey its language lessons. The end result provides children with a lot advantages. Better communication skills by being exposed to multiple languages and be more effective at communicating ideas. Bilingual kids are better at reasoning their way through complex ideas and then expressing them in a clear manner. Develop skills that translate to other subjects including math and reading. Children that know multiple languages are more successful at math than children who speak just one language. Their reading skills also develop quicker than those of their monolingual counterparts. Be more culturally aware by understanding other societies through language and see that the world is interconnected. Show improved cognitive flexibility thus allowing them to go with the flow and be well-adjusted. Display Enhanced creativity because shifting from language to language gives children the capacity to use information in new and different ways. Improved memory by learning to retain more information. Sharpen listening skills, which results in being able to follow directions and complete tasks in a more timely and accurate way. This is the ultimate gift for your child. It’s so much easier for kids to learn a new language. I think this would be great.